We could be set for higher volatility in GBP crosses this week as we head for Thursday, when the Bank of England (BoE) will announce interest rates and inflation reports. This is likely to be accompanied by a statement from BoE Governor Carney. Any hint of a rates increase for early next year may cause sterling to rally. 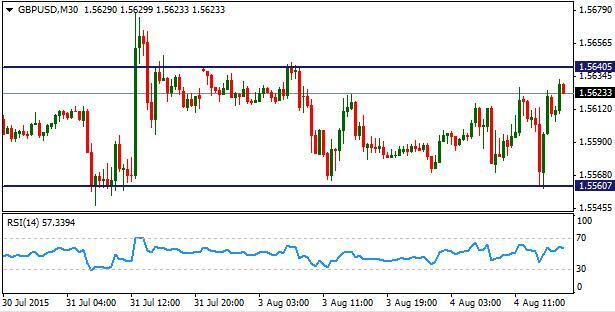 GBP/USD is trading in a tight range: 1.5560 to 1.5640. The pair has been buoyed by positive PMI data indicating that the UK manufacturing and construction industries are expanding. 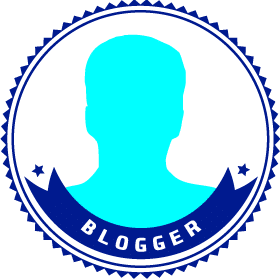 Tomorrow continues with a packed day of economic news from the UK and US, Thursday’s highlight is the BoE statement and Friday we have the highly anticipated Non-Farm Payroll (NFP) data. Buying options may be a useful way to trade an increase in volatility. Three option trade examples on MetaTrader4 are provided below. If you expect GBP/USD to rally and rise above its recent highs, you may buy a Call option, which gives you the right to buy at a specific rate over a certain period of time. The below image shows a weekly Call (C#) option in the Market Watch; to buy GBPUSD at a predefined price of 1.5662 until Friday 10am EST. It costs 35.8 pips (0.00358) to buy this option as highlighted by the orange box. If GBP/USD rises above 1.5662 before expiry, the value of the option will rise and you may make a profit. If the pair does not rise, a loss is incurred, which is limited to 35.8 pips- equal to the price paid at open. 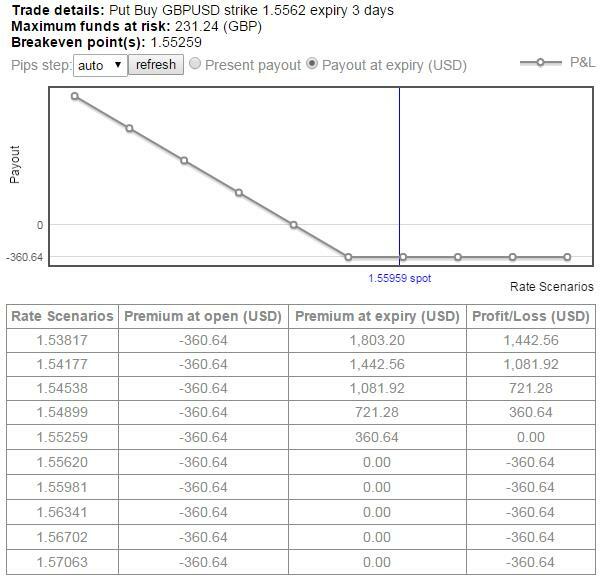 The Scenario chart below shows the options payout at expiry over a range of market rates if buying 1 lot of symbol C#GBPUSDw+0. If you expect GBP/USD to plummet, you may buy a Put option, which gives you the right to sell at a specific rate. The below image shows a weekly Put (P#) option in the Market Watch; to sell GBPUSD at a predefined strike price of 1.5562 until Friday 10am EST. It costs 33.4 pips (0.00334) to buy this option as highlighted by the orange box. If GBP/USD falls below 1.5562 before expiry, the value of the option will rise and you may make a profit. If the pair does not fall, a loss is incurred, limited to 33.4 pips – equal to the price paid at open. 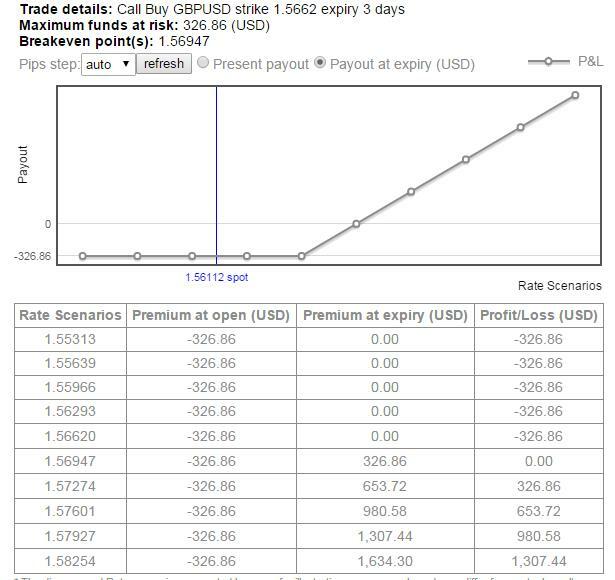 The Scenario chart below shows the payout at expiry over a range of market rates if buying 1 lot of symbol P#GBPUSDw-2. If you expect GBP/USD to become more volatile but you have no view on the direction (i.e. it could move either way), you may buy a Call and a Put at the same time. If the market rises, the Call may return a profit and if the market falls, the Put may return a profit. For example, if you were to buy both the above mentioned symbols, you would pay a total of 69.2 pips (35.8 + 33.4). If trading a deal of size 1 lot, that is equivalent to a total risk of $692. As long as GBP/USD moves far enough up or down, the position will return a profit. If the rate does not move and remains range bound, then a limited loss is incurred. 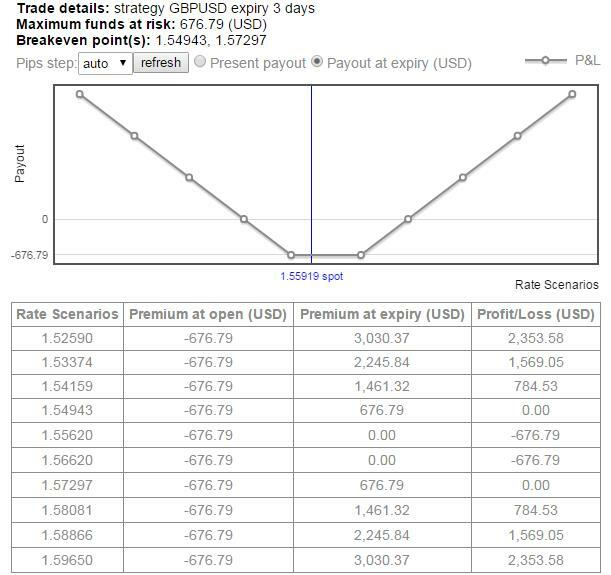 The Scenario chart below gives an indication of the profit/loss at expiry over a range of GBP/USD rates. You can see that if the pair rises above 1.5729 or falls below 1.5494 by expiry, a profit is made. The name given to this type of option strategy is ‘Long Strangle’. Lastly, you may also trade the opposite position; that is a ‘Short Straddle’. This allows you to benefit from a stabilizing market and you may profit if GBP/USD remains trading within a range until Friday 10am EST. But note that, unlike buying options, selling options may expose you to unlimited risk, which can be managed using stop-loss orders. To set-up an option strategy of this type you would sell a Call and Put at the same time.